Susan Sills proudly stands in front of her generator. 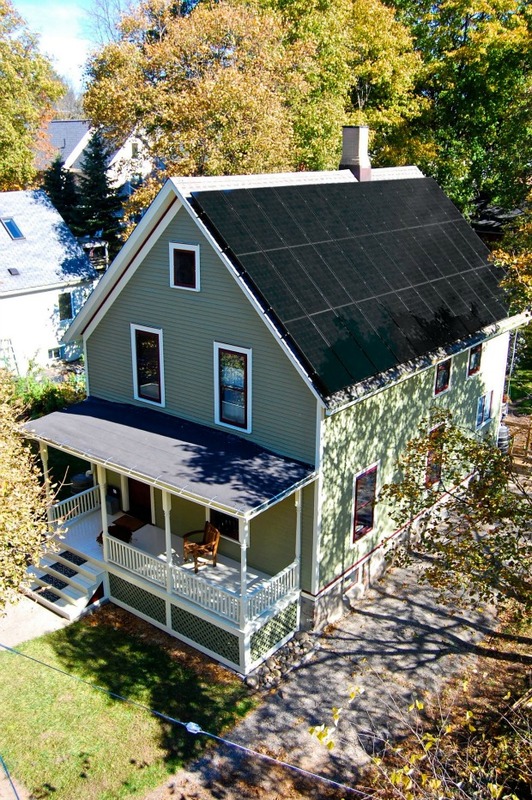 The Grocoff’s of Ann Arbor, Michigan claim to own the country’s oldest net-zero energy home. Matt Grocoff and his family live in what they call the country’s oldest net-zero home. That means, with help from solar panels, geothermal heating and cooling, and smart appliances, they produce more energy than they use. The victorian house was built over 100 years ago. It’s situated on a quiet street in Ann Arbor, Michigan. The Grocoffs call their experiment the Mission Zero House, in honor of Ray Anderson, the carpet tycoon who, in 1994, pledged to transform his multi-national carpet company into a net-zero model of sustainability. “So we figured if they can do that with a multinational corporation, why not do it with a 100 plus year old Victorian home,” Grocoff said. Ten years ago this week, North America experienced the largest blackout in its history. That event led to new laws and efforts to improve the reliability of our nation’s power source. But some consumers have taken matters into their own hands. To Grocoff, his experiment isn’t radical at all. It’s practical. “If you don’t make your home more energy efficient, if you don’t put solar panels on the roof. It costs more not to do that,” Grocoff said. After rebates, incentives and a federal tax credit, the solar panels cost the Grocoff’s $15,000. In just 10 years, they estimate they’ll save around $35,000 in energy costs. However, these savings don’t mean they’re not susceptible to blackouts. Grocoff compares the current grid to a string of old Christmas lights. Susie Sills, however, will be okay if the lights go out in her region of Southeast Michigan. In August of 2003, roughly 50 million North Americans lost power. Sills was not one of them. That’s because in her backyard, she has a generator that runs her entire household using natural gas. Sills lived through enough basement floods and power outages to finally have an excuse to get the generator. With an unending string of extreme weather events in recent years, there’s been an uptick in generator sales throughout the United States. The natural gas generators can cost from five to over $30,000. The portable, petroleum operated generator are more affordable. “It’s difficult for people to think about the work and the outlay, the expense, until they’ve lost their power, their comforts and then everybody usually is calling their local electrician or a company that can help them install the generator,” Sills said. Sills and Grocoff are not alone. Generac, the company that makes Sills’ generator, has seen a steady increase in the sales of their residential products. And last year an estimated $11.5 billion worth of solar electric products were installed in the United States. Grocoff is a big believer in up-front investments. He isn’t just interested in keeping the lights on. He wants to change the way we use and distribute energy. His family has invested tens of thousands of dollars in solar panels, insulation and geothermal heating and cooling. And already it’s paying off. His July energy bill was negative $79.84. But Grocoff feels like he won’t be completely safe from outages until the country creates a decentralized system of energy production and distribution. So the challenge becomes, how can people figure out a way to raise the capital they’ll need to make their homes sustainable. There is, however a website that compiles state incentives for renewable energy opportunities. Furthermore, The Department of Energy is sponsoring a contest called SunShot. The idea is to catalyze affordable residential solar installations across the country. They’re offering up to $10 million in cash awards to the first three teams that can put solar on roofs for an average of $1 per watt for non-hardware costs.